Now this is more like it: steady pacing! 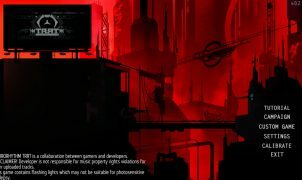 A burgeoning new world! An engaging cast! 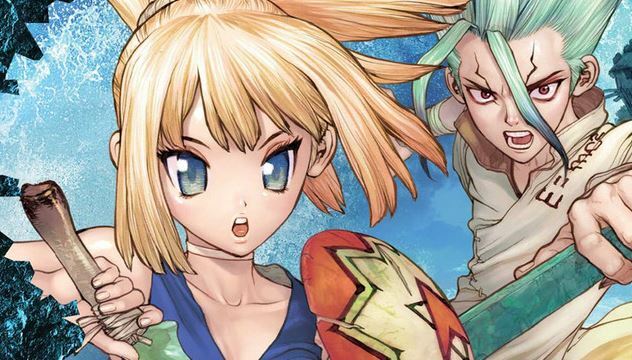 In Dr. Stone’s rush to dodge the editorial axe, its opening fumbled with inconsistent, one-note protagonists and hurried storytelling. When the titular Dr. Stone (brainy Senku Ishigami, for those just catching up) ousts muscle-head Taiju and staple girl Yuzuhira in favor of Kohaku and Chrome — primitives hailing from a rustic village of unknown origins — Dr. Stone effectively resets itself, only retaining Tsukasa as a distant, villainous threat. What sorcery, as Chrome would call it, writer Riichiro Inagaki pulled off in amending for any past writing missteps remains unknown, but he makes it look as easy as breathing. 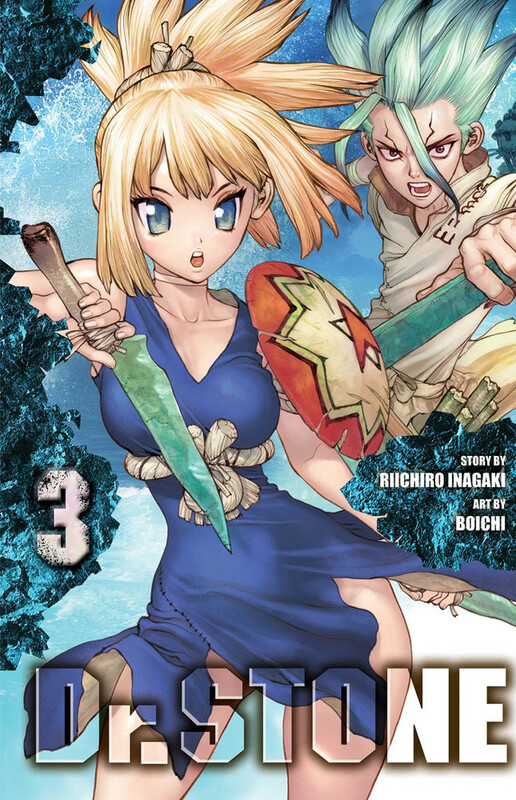 Labeling Volume 3 a build-up intermission would feel off: true, it’s heavy on world-building and introducing new characters, but even a casual examination unveils what really makes Dr. Stone tick: getting super stoked about science. With Senku’s current goal being “convince superstitious primitives the wonders of science and have them help revive the petrified stone world/battle Tsukasa,” Inagaki’s rich library of scientific citations (including consultant Kurare, who even assists with the localization!) 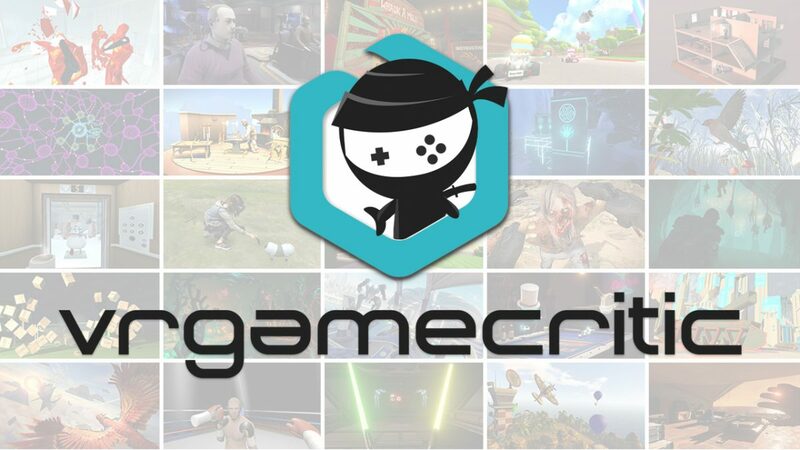 fuel an inventive momentum, with our brilliant prodigy and his new comrades brainstorming, conducting trial-and-error, and producing an assembly-line of inventions. That it never drags is a boon — be it ramen or magnets, their inventions chip away at the village’s apprehension, and before we know it, we’re enraptured by a veritable tale of edutainment. Our new protagonists certainly aid this process, not the least in our new heroine Kohaku. Functioning as a parallel Taiju, the village’s most capable warrior — or “lioness” as Senku calls her, much to Kohaku’s chagrin – possesses actual agency beyond “win heart of affection.” Her curiosity with Senku’s science beckons her participation into an unknown world, seguing into a motivational catalyst: with her rescue owed to science, surely it can forge a path to curing her sister’s untimely illness. With her distinguished independence playing more a compelling foil to Senku than Taiju’s simpleton obedience, we ponder how her development will expand the story. Chrome’s scientific foil to Senku also functions as an improved Taiju — naturally clueless to Senku’s long-gone civilization, his own rustic brand of “sorcery” lends a natural enthusiasm that counterbalances Senku’s more reserved approach. Certainly, his own archaic brand of knowledge is no match for Senku, but his mineral collection proves his worth to our titular Dr. Stone; to Senku, it’s concrete evidence that natural human curiosity breeds experimentation, and so even a “blockhead” like Chrome may be the most valuable asset of all. Chrome, too, ultimately participates for the safety of another (Ruri), yet the very last panel affirms a desire to cast off his inadequacy and stand toe-to-toe with Senku’s braniac prowess. That this volume graciously includes a 5-page side-story elaborating upon their Arithmetic Battle is much appreciated, if only for portraying the gulf between the two. Kohaku, our new leading lady, assists Dr. Stone‘s reversal. It helps that the budding supporting players engage as well: regarding the new villagers, we have little Suika, donning an adorable apple mask that she tucks in and bobbles about as she spies on her fellow villagers, and the quarreling dynamic between guardsmen brothers Ginro and Kinro (who might be thiiiiis close to abandoning their duties for gemstones). We even witness another outsider: Gen Asagiri, whose wildcard neutrality quickly rendered him one of the most popular characters. Even if his magic tricks sneak our heroes out of life-threatening jams, his self-serving nature swears an allegiance only towards the winning side. With his connections to Tsukasa, it’s anyone’s guess what role he’ll ultimately play, let alone which team he’ll choose. 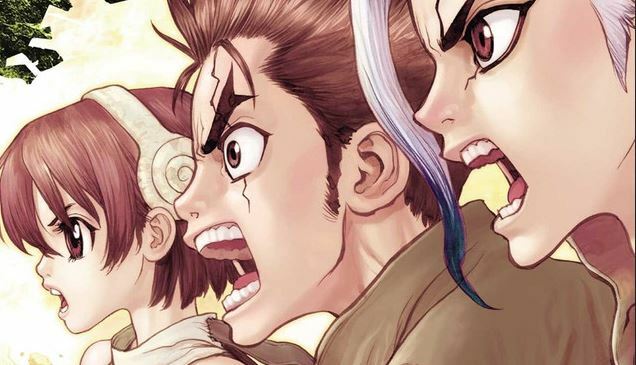 Backed by an ever-looming threat of survival, Dr. Stone‘s edutainment expertly fluxes between apprehensive drama and giddy, boisterous commotion — a feat impossible without Boichi’s careful balance in lavish detail and cartoonish anarchy. Take issues with his female anatomy if you wish, but his art is a natural conduit for ecstatic, over-the-top facial expressions, often reserved for Chrome’s euphoric discoveries. Even the bonus pages had me reminiscing of Inagaki’s previous work in Eyeshield 21, with fun trivia and character personality tests adding that much more “world” to this volume. It’s just great fun, all in all — with a relatable cast we root for, the series is not left wanting more, and I already can’t wait to revisit the events of the next volume. 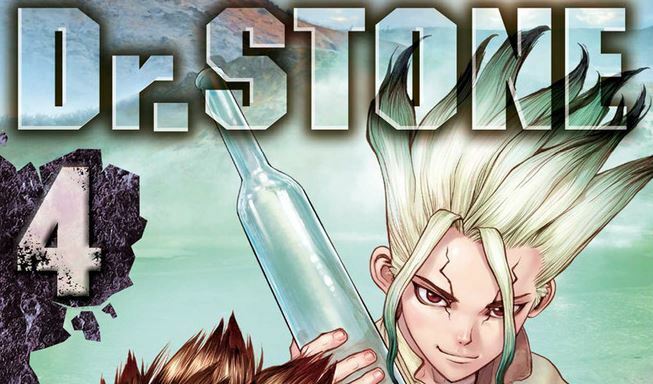 When we exit this book with Senku’s scrunched-up euphoria of self-congratulatory glee, we’re excited too: not merely because he’s at the cusp of achieving his plans, but because Dr. Stone’s finally reached its potential as a compelling work of shonen manga. It didn’t just win the genre’s 64th Shogakukan Award for nothing, y’know.